A contract is a deliberate and voluntary agreement between two competent persons that can be enforced by the law and can either be written or spoken. They can be made in regards to a tenancy, lease or sale of property and employment. There is a consideration. This means that there has to be something of value exchanged between the parties. Unilateral and bilateral contracts are types of contracts made on daily basis in professional and personal matters. A unilateral contract is a contract done by one person or one party, hence allows one person to make an agreement. The person who makes the contract is hence held responsible for ensuring the terms and conditions of the contract. In this type of contract, it is important to state a specific period under which the contract is valid. Examples of a unilateral contract are a case scenario whereby a person promises a reward to a person who finds a lost item. Insurance companies also involve unilateral contracts, where the insurance company agrees to pay the insured specific amounts of money in case a certain incident occurs. A bilateral contract is a contract between two or more parties. Normally, one party makes a promise to another party to do something in exchange for the other party’s promise to also do something. 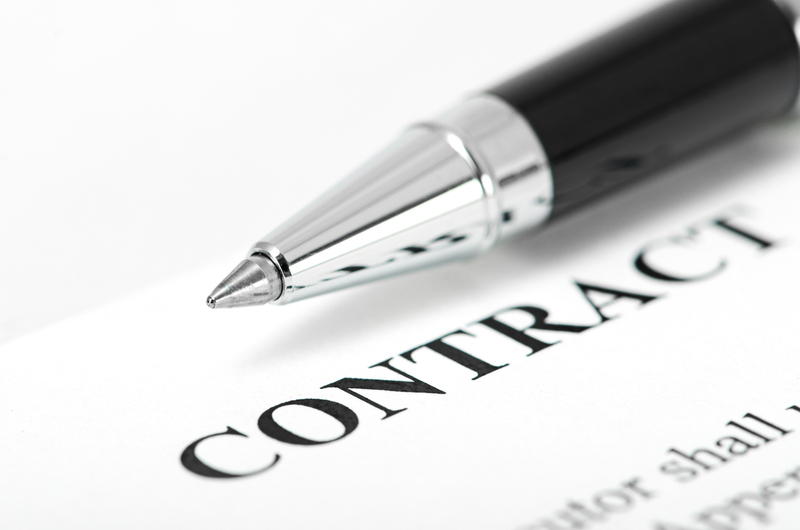 This is the most common type of contract in the day to day activities. One party must actually perform, as opposed to promising to perform, such as the actual making of a payment, or the act of offering a service. For example, ordering a meal at a restaurant, receiving medical care, making a purchase, real estate contracts, electricity services and, gas services, just to name a few. Both contracts can be breached. This means that the contract can be broken due to the failure to fulfill any terms in the contract. While unilateral contracts involve one person or party, bilateral contracts involve one or more parties. In a unilateral contract, any offer of a reward is made and effected only be the promisor, who is legally bound to the promise he made. The promisee in this case only accepts the offer. On the other hand, in a bilateral contract, offers and rewards do not apply since both parties are required to make promises. In a unilateral contract, the promisor has to specify the duration of the offer. In bilateral contracts, however, both parties have to agree on a timeframe in which the agreed service or product shall be delivered, failure to which can lead to a breach in the contract. For any party or person willing to go into a contract with another, the terms must be clearly spelled out and understood by both parties. The contract also has to be legal and must be mutually agreed between the parties involved. Contracts ease the way of life, as they used not only in business settings but also in day to day life of people. It should also be noted that these contracts can be written or oral. Tabitha Njogu. "Difference Between Unilateral and Bilateral Contract." DifferenceBetween.net. 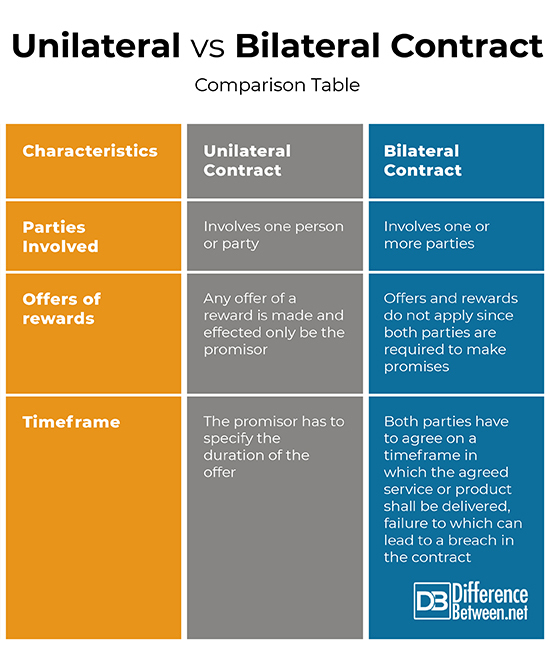 January 17, 2019 < http://www.differencebetween.net/business/difference-between-unilateral-and-bilateral-contract/ >.